Dr. Erickson and Dr. Hong are available 24 hours a day, seven days a week for any orthodontic emergencies. Sometimes, appliances might be broken or bent during your orthodontic care. If there are any disturbances, such as loose bands, loose brackets, broken or poking wires, please call our office. In the meantime, here are some helpful hints to remedy some of the problems you may encounter. If a tie wire is irritating your mouth, cover it with wax or tuck it under the arch wire with a blunt object like a pencil eraser or Q-tip. A loose band or bracket can generally be left in place until seen in our office. 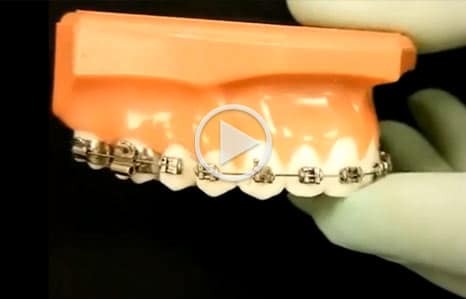 Call The Silver Spring Orthodontist when you notice a loose band or bracket. We will schedule you to reattach the loose appliance if indicated. A broken or poking archwire can often be bent in with a pencil eraser or cut with nail clippers. Call our office if you do not feel the problem has been resolved properly. Following a direct injury to your mouth or teeth, whether undergoing orthodontic care or not, immediately ice the injured area and you should contact your regular dentist as soon as possible. An x-ray of the involved tooth or teeth may be needed to determine the extent of the injury. If a tooth has been displaced, knocked out, or fractured, it is best to contact your family dentist first, since we may not have the necessary materials or anaesthesia required to treat these injuries. If the appliances are dislodged or displaced, we will need to replace or adjust the appliances as soon as possible, depending upon the comfort level of the patient.